Born in Welkom in South Africa's Orange Free State to a surgeon and a nursery-school teacher, Shuttleworth attended school at Western Province Preparatory School (where he eventually became Head Boy in 1986), followed by one term at Rondebosch Boys' High School, and then at Bishops/Diocesan College, where he was Head Boy in 1991. Shuttleworth obtained a Bachelor of Business Science degree in Finance and Information Systems at the University of Cape Town, where he lived in Smuts Hall. As a student, he became involved in the installation of the first residential Internet connections at the university. In 1995, Shuttleworth founded still-extant Thawte Consulting, a company which specialized in digital certificates and Internet security. In December 1999, Thawte was acquired by VeriSign, earning Shuttleworth R3.5 billion (US$575 million, equivalent to $831 million in 2018). In September 2000, Shuttleworth formed HBD Venture Capital (Here be Dragons), a business incubator and venture capital provider. In March 2004 he formed Canonical Ltd., for the promotion and commercial support of free software projects, especially the Ubuntu operating system. In December 2009, Shuttleworth stepped down as the CEO of Canonical Ltd, Jane Silber took Canonical CEO position. Shuttleworth resumed the position of CEO of Canonical in July 2017 at the end of Silber's tenure. In 2001, he formed the Shuttleworth Foundation, a nonprofit organisation dedicated to social innovation which also funds educational, free, and open source software projects in South Africa, such as the Freedom Toaster. In 2004, he returned to the free software world by funding the development of Ubuntu, a Linux distribution based on Debian, through his company Canonical Ltd. In 2005, he founded the Ubuntu Foundation and made an initial investment of 10 million dollars. In the Ubuntu project, Shuttleworth is often referred to with the tongue-in-cheek title "Self-Appointed Benevolent Dictator for Life" (SABDFL). To come up with a list of names of people to hire for the project, Shuttleworth took six months of Debian mailing list archives with him while travelling to Antarctica aboard the icebreaker Kapitan Khlebnikov in early 2004. In September 2005, he purchased a 65% stake of Impi Linux. On 15 October 2006, it was announced that Mark Shuttleworth became the first patron of KDE, the highest level of sponsorship available. This relationship ended in 2012, together with financial support for Kubuntu, the Ubuntu variant with KDE as main desktop. On 17 December 2009, Mark announced that, effective March 2010, he would step down as CEO of Canonical to focus energy on product design, partnership, and customers. Jane Silber, COO at Canonical since 2004, took on the job of CEO at Canonical. In September 2010, he received an honorary degree from the Open University for this work. On 9 November 2012. Shuttleworth and Kenneth Rogoff took part in a debate opposite Garry Kasparov and Peter Thiel at the Oxford Union, entitled "The Innovation Enigma". On 25 October 2013, Shuttleworth and Ubuntu were awarded the Austrian anti-privacy Big Brother Award for sending local Ubuntu Unity Dash searches to Canonical servers by default. A year earlier in 2012 Shuttleworth had defended the anonymisation method used. 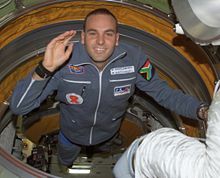 Shuttleworth gained worldwide fame on 25 April 2002, as the second self-funded space tourist and the first-ever South African in space. Flying through Space Adventures, he launched aboard the Russian Soyuz TM-34 mission as a spaceflight participant, paying approximately US$20,000,000 (equivalent to $27,859,389 in 2018) for the voyage. Two days later, the Soyuz spacecraft arrived at the International Space Station, where he spent eight days participating in experiments related to AIDS and genome research. On 5 May 2002, he returned to Earth on Soyuz TM-33. In order to participate in the flight, Shuttleworth had to undergo one year of training and preparation, including seven months spent in Star City, Russia. While in space he had a radio conversation with Nelson Mandela and a 14-year-old South African girl, Michelle Foster, who asked him to marry her. He politely dodged the question, stating that he was "very honoured at the question" before changing the subject. The terminally ill Foster was provided the opportunity to have a conversation with Mark Shuttleworth and Nelson Mandela by the Reach for a Dream foundation. He has a private jet, a Bombardier Global Express, which is often referred to as Canonical One but is in fact owned through his HBD Venture Capital company. The dragon depicted on the side of the plane is Norman, the HBD Venture Capital mascot. Upon moving R2.5 billion in capital from South Africa to the Isle of Man, the South African Reserve Bank imposed a R250 million levy in order to release his assets. Shuttleworth appealed, and after a lengthy legal battle, the Reserve Bank was ordered to repay the R250 million, plus interest. Shuttleworth announced that he would be donating the entire amount to a trust which will be established to help others take cases to the Constitutional Court. On 18 June 2015 the Constitutional Court of South Africa reversed and set aside the findings of the lower courts, ruling that the dominant purpose of exit charge was to regulate conduct rather than to raise revenue. ^ "Canonical". Canonical Ltd. Retrieved 10 August 2017. ^ a b Shuttleworth is the first citizen of an independent African country to go into space. Patrick Baudry, an earlier astronaut, was also born in Africa; however, since Baudry's native Cameroon was a French colony at the time of his birth, he is considered a French citizen. Shuttleworth also had British citizenship at the time of his flight. ^ "Mark Shuttleworth – Contact Details". Mark Shuttleworth. Retrieved 24 September 2010. ^ "Quick facts about UCT". www.news.uct.ac.za. Retrieved 15 November 2017. ^ "VeriSign Buys South Africa's Thawte for $575 Million". InternetNews.com. 23 December 1999. Retrieved 15 November 2010. ^ Mark Shuttleworth (17 December 2009). "My new focus at Canonical". Retrieved 21 December 2009. ^ Jane Silber (12 April 2017). "A new vantage point". Ubuntu Insights. Canonical Ltd. Retrieved 10 August 2017. ^ "Ubuntu carves niche in Linux landscape". CNET. Archived from the original on 6 November 2015. ^ "Shuttleworth bets on ImpiLinux". MyADSL. 29 September 2005. Retrieved 28 August 2006. ^ "Mark Shuttleworth Becomes the First Patron of KDE". KDE. 15 October 2006. Retrieved 16 October 2006. ^ "Mark Shuttleworth steps down as CEO of Canonical". Mark Shuttleworth. 17 December 2009. Retrieved 17 December 2009. ^ "Innovation or stagnation – a great debate". The Oxford Martin School Blog. 13 November 2012. Retrieved 24 December 2012. ^ Sneddon, Joey-Elijah (28 October 2013). "Ubuntu's Amazon Shopping Feature Wins Anti-Privacy Award". OMG!Ubuntu. Retrieved 10 November 2013. ^ "Ubuntu's Mark Shuttleworth wins Austria's Big Brother Award". Muktware. 28 October 2013. Retrieved 10 November 2013. ^ Lee, Micah. "Fix Ubuntu". Retrieved 11 November 2013. ^ "Amazon search results in the Dash". Mark Shuttleworth Blog Archive. 23 September 2012. Retrieved 10 November 2013. ^ BBC News, "Afronaut mourns his 'bride'", 28 May 2002. ^ "Mark Shuttleworth wants his R250 million back from SARB". htxt Africa. Retrieved 1 October 2014. ^ "Reserve Bank ordered to pay back R250m to Mark Shuttleworth". htxt Africa. Retrieved 1 October 2014. ^ "Mark Shuttleworth donates entire R250m Reserve Bank win to defend SA constitution". htxt Africa. Retrieved 1 October 2014. ^ Mogoeng, CJ; DCJ Moseneke, DCJ; Cameron, J; Froneman, J; Jappie, AJ; Khampepe, J; Molemela, AJ; Nkabinde, J; Theron, AJ; Tshiqi, AJ (18 June 2015). "South African Reserve Bank and Another v Shuttleworth and Another". Constitutional Court of South Africa. Wikimedia Commons has media related to Mark Shuttleworth.